Perm-apiculture - the Natural Beekeeping group: What is 'sustainable' beekeeping? We tend to use the term 'Natural Beekeeping' to include various other terms now cropping up in this new alternative beekeeping movement. One of these other terms is 'sustainable beekeeping'. Diagram 1: Adams, W.M. (2006). "The Future of Sustainability: Re-thinking Environment and Development in the Twenty-first Century." 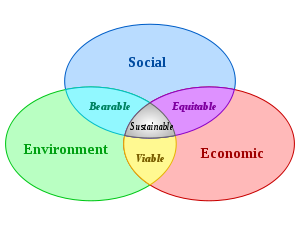 As diagram 1 shows, we use the TBL approach to balance economic development with social and environmental aspects. Achieving balance usually involves compromise and in a world where the economy and its constant growth is generally prioritised above all else, social and economic impacts ensue. Diagram 2 shows another view of the TBL - this time arranging the aspects in a nested format. Here we see that the economy is part of our society, which itself is part of the environment. Without the environment there is no society and the economy is just a part of our society. Watching or reading headlines today, one would think that society and the environment are instead part of the economy. So what has all of this got to do with sustainable beekeeping?? These initiatives are fantastic and certainly important components of a sustainable approach to beekeeping. 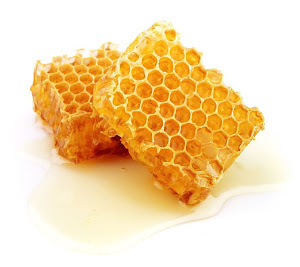 In terms of Natural Beekeeping, we may include an additional component - a focus on the bees themselves. Indeed, David Heaf, in his book The Bee-friendly Beekeeper - A sustainable approach proposes adding a fourth factor of 'bee-appropriateness' to the TBL. Natural beekeepers are primarily 'bee-centric' and their practices, meaning we aim to prioritise the needs of the bee/colony. Obviously there are limits to this when we actually keep them in artificial hives. And in the context of urban beekeeping, we can't put the needs of bees above those of our neighbours! Perhaps a practical example of the underlying principle here is honey. 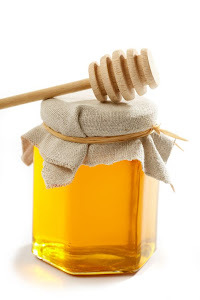 The production of honey for sale is of less (often no) importance to a small scale Natural Beekeeper. When a business depends on the sale of honey for its survival, there is economic pressure to increase/maximise yields from the hives. This may then involve conventional (commercial) beekeeping practices that we could consider to be less 'bee-friendly', or sustainable for the future. Beekeeping on a small scale, with no commercial pressures, frees us from this limitation. Having said that, there are a number of professional beekeepers now using the Warre hive extensively for their business. Note the important point of 'small scale'. We'd define this as perhaps keeping one or two hives in your own garden. This way you can focus your attention on observing those hives and enjoying the activities of the bees. Note also that these bullet points (as well as the ethics of concerns for the bees) are appropriate within the principles and practices of Permaculture. 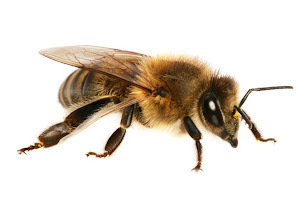 the appropriateness of promoting the keeping of European honey bees in Australia, which are non-native and compete with local fauna. In summary, the Perm-Api group seeks to promote Natural Beekeeping which encompasses Permaculture principles and sustainability. This article has been amended following feedback regarding its bias - with apologies.